The application note provides an overview of engine test stands. The document breaks down the components of a test stand, the challenges faced when implementing drive controls on test stands, and a common drive solution. The document further outlines the benefits to be achieved implementing a matrix drive on a test stand verses a conventional drive solution. Excel Industrial Electronics, Inc. in Clinton Township, MI is a premier industrial distributor, system integrator and authorized service provider for Yaskawa America, Inc. A firm known for personalized, economical drives solutions for customers, they were able to utilize a Yaskawa U1000 Industrial Matrix drive to solve a steel bar grinding problem for a Detroit area machine builder. Reel-O-Matic, in Oklahoma City, OK, is a leading manufacturer of wire, cable, and flexible material handling machines for a variety of industries including aerospace, government, oil/gas, medical, automotive, crane, plastics, and telecommunications. Specialists in reeling, coiling, and measuring applications, they used Yaskawa’s U1000 Industrial Matrix Drive to resolve a couple of their specific application challenges. When a Massachusetts based municipal water treatment facility needed to upgrade their aging 350HP 18-pulse drives, they turned to a local Yaskawa drives distributor, who recommended a reliable, compact, and cost effective retrofit with Yaskawa’s U1000 Industrial Matrix Drive. L&S Electric in Schofield, WI is the Midwest’s largest service center for rotating apparatus repair and a leading supplier of integrated systems for the power-generating industry. They are known for their dedicated people, quality products, and above all, their service capabililty. As a Yaskawa premier industrial distributor and authorized service provider, they were easily able to recognize a need for the Yaskawa U1000 Industrial Matrix Drive for a local machine builder. When the City of Springfield, MO had a problem in its major municipal wastewater facility, it called on JCI Industries of Joplin, MO to provide a solution. JCI has been a Yaskawa America, Inc. partner for over 20 years, supplying drive, motor, and pump solutions to the water/wastewater treatment industry. This piece takes a look at how they employed the Yaskawa U1000 Industrial Matrix drive to retrofit the existing system. 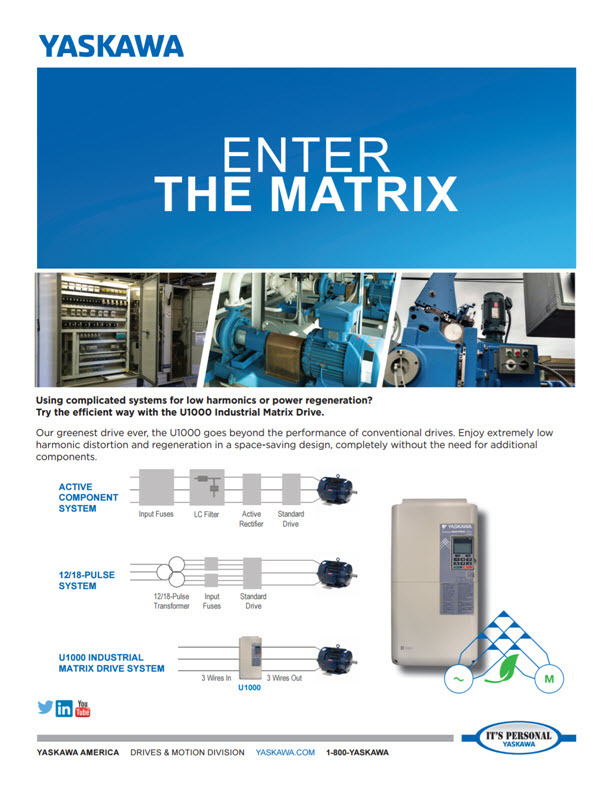 The 6 page tri-fold brochure introduces common applications that utilize the U1000 Industrial Matrix Drive. 2D CAD Drawing in DWG and PDF formats showing dimensions, mounting holes, power terminals, and control terminals for drives with Nema type 1 kit installed.